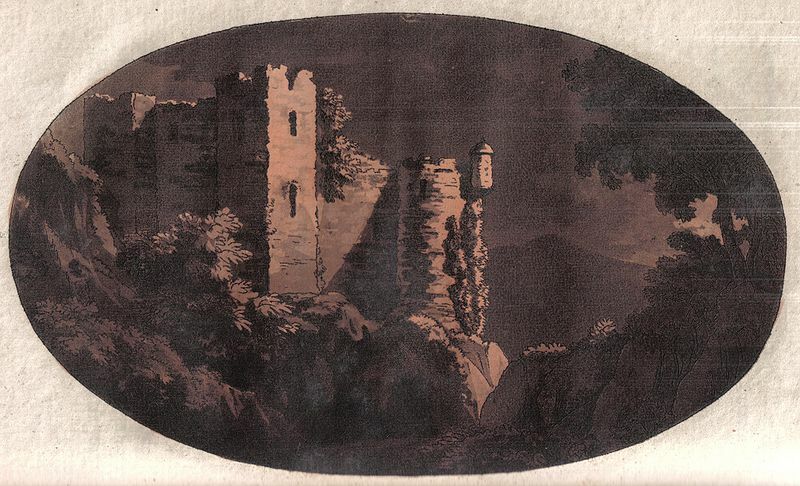 William Gilpin, an 18th century English artist, clergyman, schoolmaster and author, helped develop the idea of the picturesque in landscape painting. As artists on both sides of the Atlantic turned their gazes towards the land, a curious belief began to be expressed regarding beauty and nature. Gilpin was among those who believed that the artist had the right to “correct” nature’s imperfections. In his Three Essays (1792) Gilpin declared: “I am so attached to my picturesque rules that if nature gets wrong, I cannot help putting her right.” What are your thoughts on the artist “getting her (nature) right”? Artists are interpreters. They do record events, but with a definite bias. Editing reality to create something clearer or better is a longstanding artistic tradition… we give artists a “license” to change reality to fit their visions. Artists have the ability to conflate all of space and time to create a new reality. They are not required to confine depictions to what is visually accurate as long as their work contains an emotional truth. Chinese ink landscapes are my favorite. The Chinese artists felt like Gilpin did: perfecting nature was not wrong. They are explorations of the philosophical and spiritual aspects of nature. The inner landscape depicted by an artist and how it differs from reality, the psychology behind the iconography and style, is much more interesting than something 100% accurate. yea but can these painting be considered an american landscape if the do not hold truth to what the real landscape look likes? If the artists changes what they see to what they want to see and what is in their heads does it not become more of a fantasy landscape? Its kind of like those movies that say they are based on a true story but everyone knows they take the story and spin it to make it so that it engages and interests the viewers. So these landscapes should say they are based on the american landscape because while it may resemble it, it is not the true landscape. Well….first off what an obscure question. Also we have one of the Hudson River school painters here but nothing included to talk about that piece, why? First off nature has no imperfections things can only be the way they are. This will apply to more the just the landscape work of the times. Really how do you get nature right? Well I feel we can never get nature right since its always changing. Just like if I said how many birds are in flight at this very moment, this can never be solved since ones will land and fly at every second. This rule will apply to nature as well. It can never be captured since its always moving. There is just o putting her right, nothing can be put right. The quote seems a little egotistical and myopic to really hold value. As far as the hudson river piece is concerned it has to to be elevating the mundane like many paintings do. Sure light will be seen like this at one time but not to these measures. So getting nature right is an impossibility no matter what. Its just a quote with some ego behind the idea. I like the thoughts but not idea of what to try to tame the nature of the world. Nature’s imperfections are what make it beautiful at times. However, Gilpin had an idealized interpretation of what he wanted from his nature, so he would tweak it a little. He had a vision of a different landscape and wanted to be slightly more creative by painting that instead of copying exactly what is in front of him. I read that for Gilpin it was more of a strict set of rules and was up to other painters later on, like Thomas Doughty. I agree with Eric that you can’t necessarily get nature right because it’s not necessarily wrong to begin with and that to some extent this view is subjective. On the other hand, there are instances when nature does in fact get it wrong. Genetically speaking there are times when things do not develop properly. People as well as most thing in nature have an affinity toward symmetry. Perhaps this is part of what Gilpin is referring to. The only way to justify that there are imperfections is to demonstrate that there are mutations. They would be referred to as typical or “normal” examples or atypical or mutated versions of things that happen within nature. Of course, this is most likely overanalyzing the staement. Gilpin probably just sees nature a particular way in his imagination. And, when he goes off to paint what he sees… he is probably unhappy with what is before him. Because of this, he “fixes” it to his liking. As artist we all have a vision, and though we may look to things for inspiration we often alter what we see to what our perception of “right” is. I think that Gilpin was creating his own interpretation of what he thinks and desires nature to be. I really do not like the idea of playing God and messing with environment. I think a person needs to be very egocentric to try and do that. These “imperfections” he was talking about might be seen by someone else as divine creations and the fact that he was “fixing” it to match his taste, I think, makes his landscapes more imaginary than real. I feel like artists are entitled to do whatever it is that they want to. However anyone wants to interpret what they see the can do so. I don’t necessarily think that Gilpin could “correct” nature’s imperfections. I don’t even know what that means. Nature is natural, and how do you “correct” that without using esthetics? I understand that he may have been the type that pushed himself to perfection, but I think he may have pushed himself so much that it got to be a bit unrealistic, although beautifully done. I believe imagination goes hand in hand with art, even with life. In many ways, I agree with Gilpin because it is pure creativity in art form. It all goes back to when we were kids, drawing pictures of what a happy family looks like. If Gilpin wanted to express his paintings in his own way, he did it without rules. Gilpin may have thought of “putting her right.” in terms of landscape painting solely for his aesthetic purpose and style. His way of painting and editing is probably what separated him from other landscape artists. I see it as his way of injecting drama to a picture landscape which contributes to its appeal. Both Americans and Europeans turned towards landscape paintings for several reasons. Painted landscapes were associated with religion for some people during this time because of the idea of “manifest destiny” and getting to know God through nature. According to our textbook, for some landscape paintings were representative of the “American dream” because of the “opportunities it offered.” Many people thought that the “exotic west” was filled with unlimited land in which only progress and advances could proceed. Some even used the paintings as a reminder of times when things were “slower and easier – somehow better” before the Industrial Revolution when a “family could live in harmony with the wilderness.” These positive associations with landscapes lead to the romanticism of them. I think that William Gilpin’s quote is directly related to this time when landscapes were portrayed romantically. 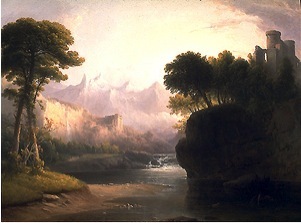 This notion of a flawless landscape in which the artist had the ability to “correct nature’s imperfections” can be directly supported by Thomas Doughty, whose paintings were often so ideal and fantasy-like that many patrons thought it was “too poetic” causing “nature [to lose] its reality.” I can see how easily it would be for an artist to get lost in picturesque fantasies of landscape, especially during that time when only positive aspects like hope and memories were associated with it. I think they’re beautiful paintings and the artist has every right to interpret the landscape around them however they want – even if that means perfecting nature. When I think of a goal I have, for example, like moving to New York and working in an art gallery, of course I think of it like a fairy tale with a happily ever after because that’s how you perceive amazing things in the future – it’s like a dream. That’s how dreams are supposed to be and I think that same feeling was expressed when these people thought of the west and the endless possibilities and things that they could do in order to have a better life, so I completely understand the fantasy-like portrayal and the perfecting of nature in their case. William Gilpin wanted his landscape paintings to be picture-perfect. So if he saw something in the landscape that was imperfect, he “corrected” it. I believe he wanted to create a fantasy world where everything was visually pleasing. I find imperfections unique and special, but Gilpin used his own imagination and creativity to paint his landscapes. I don’t know why these artists felt the need to “correct” nature, especially at a time when they were discovering all of the magnificent things the new world had to offer. Nature is beautiful in all of its imperfections. That’s not to say that these paintings aren’t beautiful as well, but I think these artists should have appreciated what was in front of them more instead of changing it into what they thought it should have looked like. I see these paintings as a battle between nature and man. It looks to me like man had tried to take over the land by building castles inside of these highly dense forest areas. If you pay attention to the imagery it looks like you are viewing these structures from the perspective of the forest looking like a predator to the buildings. If you look carefully it looks like the forrest is trying to take the land back and there is growth on the buildings. I think that subconsiously the artist is wanting make “her nature right” by showing the domance that nature has over modernism. Gilpin like so many artists who paint nature, always go one step further to better the composition. They are not like other artists who paint what they see in front of them and be satisfied with the natural outcome of it. Instead they tend to study every detail of nature and enhance it in order to make it more beautiful. This goes to show that artists paint differently from each other and that no one is alike. Gilpin is an example of this, for he created paintings of nature in his own way, feeling the need to correct certain parts not as a means to distort the picture, but rather better it to make it unique and more graceful. However what they are making is not nature but art. I believe it is in itself nature when it is in our human nature to alter a landscape, therefore it is hard to condemn them for trying to make something ‘right’ when there is no right or wrong to it. We tend to forget that we ourselves are a part of nature and our creations are a product of that, so its really just a tangled mess, which in the end, there is no wrong to altering it. I think that it is the artists’ choice whether to create something resembling his or her interpretation of life, or to create an alternate representation. It is then up to the viewer to accept or reject the challenge of deciphering the artist intention and delivery of that message. I think that landscapes as well as any other subject can be visually transformed to add or subtract likeness of realistic qualities to any degree and yet still be identified and interpreted by the viewer as something he or she will make as something in the context of their own reality. If Gilpin wants to “fix” natures “wrongs” then it is up to him. I see “getting nature right” is just painting nature in Gilpin’s preferred way. It is his painting and he has the absolute right to alter his artwork in any way he likes. Isn’t that the greatest thing as an artist? In modern time, I bet most photographers, including myself, edit and adjust their works in photoshop so that it could achieve their favorable result. I see it no different to painting an idealized landscape. Personally, it doesn’t really bother me when he says “getting nature right.” It ultimately is up to the artist what they want to capture. Art doesn’t always have to be an illustration of reality and artist don’t always have to paint what is displayed in front of them. As an artist, Gilpin chose to paint what he felt was necessary to capture a beautiful landscape. There is no limit to what an artist can and cannot paint and creating to him a more beautiful landscape than the one in front of him should be an okay thing. I think each artist already has their own take to nature. What’s in front of us may never lie, but our eyes gives us lies. We all see and notice light and color differently. So even by painting what our eyes see, there’s already a little alteration to the actual scenery. Gilpin just wanted to capture what he wanted to see. He made it his paradise and escape. I think with landscapes artists have a fair amount of creative discretion and there shouldn’t be such a huge concern with “getting her right.” There are so many colors, shapes, patterns, and objects in nature that an artist shouldn’t be concerned if they make an error in replicating a scene, it’s simply something new or something that could have been there at another given time. I don’t think nature has any imperfections, and I don’t think an artist should “correct” it, but rather expand upon it. I think that an artist has every right to make their painting look the way that they want, but I do not agree with William Gilpin when he says that he is “putting her right.” No human being has any right or power to correct nature. We were created to live here. We have enough power that we can change nature, but I do not think that we are ever “correcting” it. While I think that accurately painted landscapes are wonderful I feel like there is room in the art world for the artist to create interpretations of how he thinks the natural habitats in his paintings should look. He is able to create a personality and charm for his landscapes that is only limited by his imagination. Doughty, in his painting Fanciful Landscape, turns an ordinary landscape into a lush, rugged and violent looking landscape. It is entirely acceptable if the artist believes he can improve upon or change the feeling of a landscape just so long as they respect what was already there. Perhaps Gilpin is searching for the right way to prove his dedication to his craft. We all have our ways of seeking approval. Some do so trying to appeal to the critics. Others do so by hiding their artistic talent and appeal to the forces that kill it: lack of utilization. Gilpin’s statement rings true to the student who wants to perfect landscape painting. The student should seek to master the creative process of painting nature to the extent that the student can correct the landscape if there were ever a mistake made by nature. Talent is not dedication, yet dedication is a talent one would be wise to cultivate.